Feel what life is like onboard an aircraft carrier. Visit the USS Midway in San Diego and walk in the shoes of the 225,000 Midway sailors who called the longest-serving aircraft carrier home. More than 60 exhibits, 29 restored aircrafts, two flight simulators and a self-guided audio tour make this a fun and educational experience. Open 10:00 a.m. to 5:00 p.m. daily. Last admission at 4 p.m. Closed on Thanksgiving Day and Christmas. What can I do at the USS Midway Museum ? No visit to the USS Midway Museum is complete without a few "must do" activities. Climb in to one of two flight simulators and feel the adrenaline rush of flying a military aircraft. Meet honored WWII veterans, eager to share their stories. You can also tour the ship's sick bay and imagine the challenges of undergoing surgery at sea. 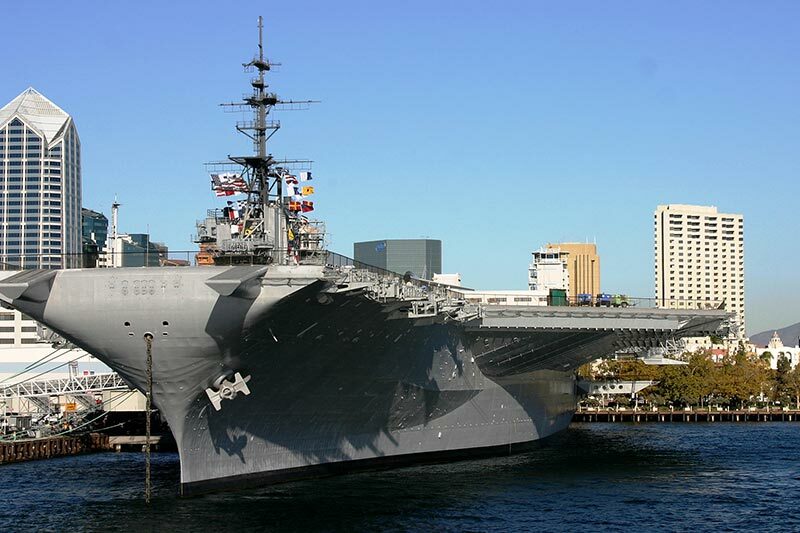 What is the USS Midway named after? The longest-serving aircraft carrier in the 20th century, the USS Midway Museum is housed in and named after the carrier built in honor of the famed Battle of Midway in June 1942. In active service for almost 50 years, she was decomissioned in 1992, and donated to the San Diego Aircraft Carrier museum in June 2004.